Hero has made it official that it'll launch the Xtreme 200R in a short while, but how does it compare with its arch-rivals on paper? We find out . . . Hero has finally unveiled the much-awaited Xtreme 200R. Although this new roadster will be on sale in April 2018, the company has revealed its specs as well as all the details. And that means it’s time for us to do a quick spec-check, where we compare its specifications and features with its arch-rivals – the TVS Apache RTR 200 4v and the Bajaj Pulsar NS200. The Xtreme 200R’s styling is derived from the concept shown at the 2016 Auto Expo. However, as you can see, it has a definitive hint of the smaller Xtreme 150 so much as that it’s possible that you might mistake it for its smaller sibling. Even dimensions of the 200R remain more or less the same as the 150cc Xtreme Sports. Having said that, there are a few visual elements that differentiate it from the Xtreme Sports. For instance, it has a more muscular tank, new dual-tone graphics, new alloy wheel design, re-profiled LED tail-lamp and a sharper tail-section. Overall, the Xtreme 200R has a handsome and a well-proportionate design. The Xtreme 200R comes powered by a 199cc single-cylinder engine that develops 18.1bhp and 17.1Nm of torque. Power is transmitted via a five-speed gearbox. In comparison, both the RTR 200 4v and the NS200 better the Xtreme 200R yet again. The RTR200 is powered by a 197cc single-cylinder engine that develops 20.2bhp and 18.1Nm of torque and comes mated to a five-speed gearbox. The Pulsar NS200, on the other hand, boasts more superior specs – its 199cc engine is also a single-cylinder unit but develops a whopping 23.2bhp and 18.3Nm of torque. Plus, it comes with a six-speed gearbox. All the bikes are carbureted, but the Apache is also available in a fuel-injection variant. Another thing is that while the Hero’s motor is an air-cooled, 2-valve unit, the TVS has an oil-cooled, 4-valve setup, and the Bajaj has a 4-valve, liquid-cooled arrangement. Naturally, both the Bajaj and TVS are better in terms of outright performance. The Hero Xtreme has a diamond-type chassis, whereas the RTR200 uses a double-cradle frame. The Pulsar NS200 gets a perimeter frame. All three bikes come with telescopic front forks and a mono-shock at the back. As for braking system, all bikes come with front and rear disc brakes. The Bajaj and the Hero have single-channel ABS (acting only on the front wheel) as optional. The TVS, meanwhile, offers dual-channel ABS with the RTR 200 4v as an optional extra. In the features department, all three bikes are more or less similar in terms of what they offer. You get pilot LEDs, LED tail-lamp and halogen headlamp as standard. The Xtreme 200R and Pulsar NS200 come with part digital, part analogue instrument cluster, whereas the RTR 200 4v has a fully-digital instrument panel. The RTR200 4v also comes with a built-in lap time recorder as well as 0–60km/h timer. Hero hasn’t revealed the price of the new Xtreme 200R as yet, but it’s expected to carry a price-tag that’s just shy of Rs 90,000. 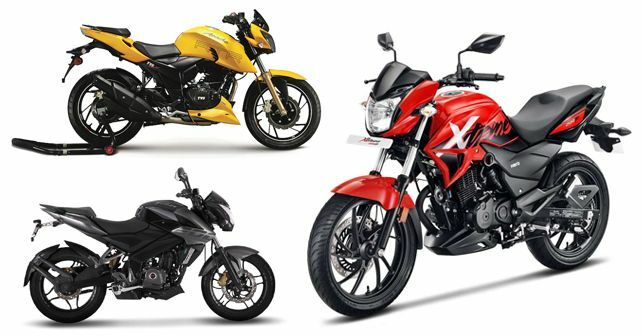 In fact, if Hero wants to attract buyers of this segment, the firm has to price the Xtreme 200R aggressively and considerably lower than the rivals – the Apache RTR 200 4v retails at Rs 93,685, while the Pulsar NS200 is priced at Rs 97,715 (both prices are ex-showroom, Delhi).